When optimizing an application's performance, consider its NDB use. For example, if an application reads a value that isn't in cache, that read takes a while. You might be able to speed up your application by performing Datastore actions in parallel with other things, or performing a few Datastore actions in parallel with each other. The NDB Client Library provides many asynchronous ("async") functions. Each of these functions lets an application send a request to the Datastore. The function returns immediately, returning a Future object. The application can do other things while the Datastore handles the request. After the Datastore handles the request, the application can get the results from the Future object. Suppose that one of your application's request handlers needs to use NDB to write something, perhaps to record the request. It also needs to carry out some other NDB operations, perhaps to fetch some data. By replacing the call to put() with a call to its async equivalent put_async(), the application can do other things right away instead of blocking on put(). This allows the other NDB functions and template rendering to happen while the Datastore writes the data. The application doesn't block on the Datastore until it gets data from the Datastore. In this example, it's a little silly to call future.get_result: the application never uses the result from NDB. That code is just in there to make sure that the request handler doesn't exit before the NDB put finishes; if the request handler exits too early, the put might never happen. As a convenience, you can decorate the request handler with @ndb.toplevel. This tells the handler not to exit until its asynchronous requests have finished. This in turn lets you send off the request and not worry about the result. Using a toplevel application is more convenient than all its handler functions. But if a handler method uses yield, that method still needs to be wrapped in another decorator, @ndb.synctasklet; otherwise, it will stop executing at the yield and not finish. Almost every synchronous NDB function has an _async counterpart. For example, put() has put_async(). The async function's arguments are always the same as those of the synchronous version. The return value of an async method is always either a Future or (for "multi" functions) a list of Futures. A Future is an object that maintains state for an operation that has been initiated but may not yet have completed; all async APIs return one or more Futures. You can call the Future's get_result() function to ask it for the result of its operation; the Future then blocks, if necessary, until the result is available, and then gives it to you. get_result() returns the value that would be returned by the synchronous version of the API. Note: If you've used Futures in certain other programming languages, you might think you can use a Future as a result directly. That doesn't work here. Those languages use implicit futures; NDB uses explicit futures. Call get_result() to get an NDB Future's result. What if the operation raises an exception? That depends on when the exception occurs. If NDB notices a problem when making a request (perhaps an argument of the wrong type), the _async() method raises an exception. But if the exception is detected by, say, the Datastore server, the _async() method returns a Future, and the exception will be raised when your application calls its get_result(). Don't worry too much about this, it all ends up behaving quite natural; perhaps the biggest difference is that if a traceback gets printed, you'll see some pieces of the low-level asynchronous machinery exposed. 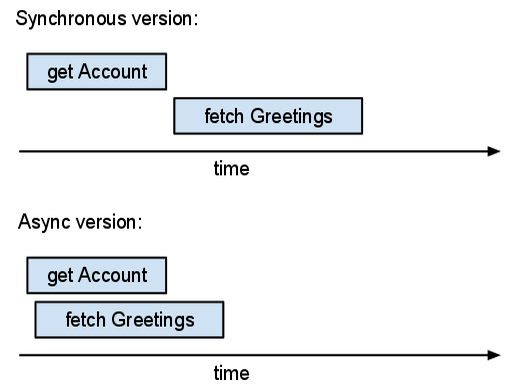 This version of the code first creates two Futures (acct_future and recent_entries_future), and then waits for them. The server works on both requests in parallel. Each _async() function call creates a Future object and sends a request to the Datastore server. The server can start working on the request right away. The server responses may come back in any arbitrary order; the Future object link responses to their corresponding requests. The total (real) time spent in the async version is roughly equal to the maximum time across the operations. The total time spent in the synchronous version exceeds the sum of the operation times. If you can run more operations in parallel, then async operations help more. To see how long your application's queries take or how many I/O operations it does per request, consider using Appstats. This tool can show charts similar to the drawing above based on instrumentation of a live app. An NDB tasklet is a piece of code that might run concurrently with other code. If you write a tasklet, your application can use it much like it uses an async NDB function: it calls the tasklet, which returns a Future; later, calling the Future's get_result() method gets the result. Tasklets are a way to write concurrent functions without threads; tasklets are executed by an event loop and can suspend themselves blocking for I/O or some other operation using a yield statement. The notion of a blocking operation is abstracted into the Future class, but a tasklet may also yield an RPC in order to wait for that RPC to complete. When the tasklet has a result, it raises an ndb.Return exception; NDB then associates the result with the previously-yielded Future. When you write an NDB tasklet, you use yield and raise in an unusual way. Thus, if you look for examples of how to use these, you probably will not find code like an NDB tasklet. make the function "return" its return value with raise ndb.Return(retval) (not necessary if the function doesn't return anything). Unfortunately, this approach is inefficient. 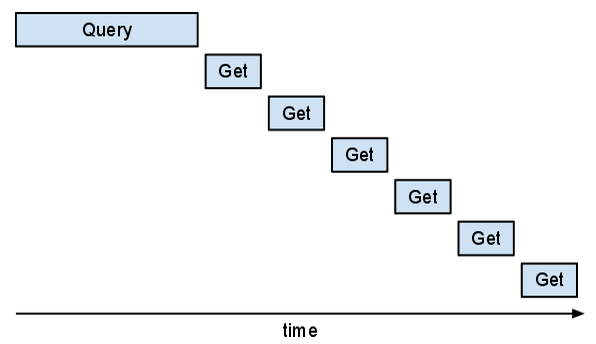 If you looked at it in Appstats, you would see that the "Get" requests are in series. You might see the following "staircase" pattern. Synchronous "Gets" occur in series. This part of the program would be faster if those "Gets" could overlap. You might rewrite the code to use get_async, but it is tricky to keep track of which async requests and messages belong together. The application can define its own "async" function by making it a tasklet. This allows you to organize the code in a less confusing way. Furthermore, instead of using acct = key.get() or acct = key.get_async().get_result(), the function should use acct = yield key.get_async(). This yield tells NDB that this is a good place to suspend this tasklet and let other tasklets run. Decorating a generator function with @ndb.tasklet makes the function return a Future instead of a generator object. Within the tasklet, any yield of a Future waits for and returns the Future's result. Take note that although get_async() returns a Future, the tasklet framework causes the yield expression to return the Future's result to variable acct. The map() calls callback() several times. But the yield ..._async() in callback() lets NDB's scheduler send off many async requests before waiting for any of them to finish. If you look at this in Appstats, you might be surprised to see that these multiple Gets don't just overlap—they all go through in the same request. NDB implements an "autobatcher." The autobatcher bundles multiple requests up in a single batch RPC to the server; it does this in such a way that as long as there is more work to do (another callback may run) it collects keys. As soon as one of the results is needed, the autobatcher sends the batch RPC. Unlike most requests, queries are not "batched". When a tasklet runs, it gets its default namespace from whatever the default was when the tasklet was spawned, or whatever the tasklet changed it to while running. In other words, the default namespace is not associated with or stored in the Context, and changing the default namespace in one tasklet does not affect the default namespace in other tasklets, except those spawned by it. The get_multi() call is still separate: it depends on the query results, so you can't combine it with the queries. If you turn one piece of code into a tasklet, you will probably want to do more soon. If you notice "synchronous" code that could run in parallel with a tasklet, it's probably a good idea to make it a tasklet, too. Then you can parallelize it with a parallel yield. If you write a request function (a webapp2 request function, a Django view function, etc.) to be a tasklet, it won't do what you want: it yields but then stops running. In this situation, you want to decorate the function with @ndb.synctasklet. @ndb.synctasklet is like @ndb.tasklet but altered to call get_result() on the tasklet. This turns your tasklet into a function that returns its result in the usual way. The three bold lines in the first version are the tasklet-friendly equivalent of the single bold line in the second version. Tasklets can only be suspended at a yield keyword. The yield-less for loop doesn't let other tasklets run. You might wonder why this code uses a query iterator at all instead of fetching all the entities using qry.fetch_async(). The application might have so many entities that they don't fit in RAM. Perhaps you're looking for an entity and can stop iterating once you find it; but you can't express your search criteria with just the query language. You might use an iterator to load entities to check, then break out of the loop when you find what you want. The URL Fetch service has its own asynchronous request API. It's fine, but not always easy to use with NDB tasklets. Unfortunately, there is no convenient way to turn this into a tasklet; a parallel yield waits for all Futures to complete—including those you don't want to wait for.